A 5 day fishing package. Experience the rich tradition of Kennebago Lake where President Hoover once fished the largest body of fly-fishing-only water east of the Mississippi. You can fish Drinkwater’s Bath for salmon or Thomas Pool for trout. Next day, you will pack a lunch and go into Upper Dam Pool, which is the home for both salmon and trout, up to 4 lbs. Then, cross over the dam for a short walk to see Camp Midway where Carrie Stevens originated and tied her famous Gray Ghost Streamer. There is much more…. For complete package information, give us a call at 1-800-633-4815 or e-mail us and mention Presidents and Poets. 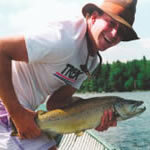 The Presidents and Poets 5 day fishing package includes: Lakeside cabin, 3 meals a day, boat, motor and guide for 4 days. $1,485 per sportsman, double-occupancy, tax not included. in the Western Mountains of Maine. For three days you will have a guide that will give you fly casting lessons and introduce you to the river and lake for a day of fishing and fun. 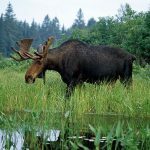 He will also guide you on our Moose Run, a canoe trip where, chances are, you will spot a moose or two. Bring lots of film! Another day you will visit Angel Falls, Height of the Land, and a trip into Rangeley to visit the Historical Society Museum, have lunch on the deck and then some time to stroll around town. The other 4 days are “free to choose” days. Test your fishing skills, swim, kayak, picnic or go for a self-guided history boat-trip around the lake. And remember mom, you don’t have to make beds, clean or cook! There are so many family adventures waiting for you here. For complete package information, give us a call at 1-800-633-4815 or e-mail us and mention Moose and More. A 5 day fishing and golf package. 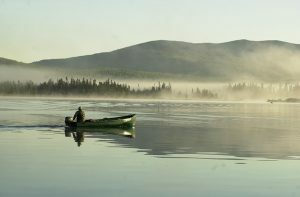 Begin your day on Kennebago Lake, the largest body of fly-fishing-only water east of the Mississippi. With a few tips from your guide, you will be ready to spend 3 of your days fishing for trout and salmon on the lake and dozens of river pools. 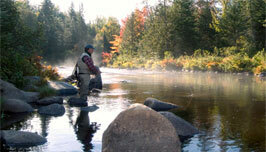 One of the days will be a trip into Upper Dam Pool, home to brook trout and salmon, up to 4 lbs. This is where Carrie Stevens originated and tied her famous Gray Ghost Streamer. After this, enjoy 18-holes of golf in the beautiful Carrabbasset Valley, and another day, golfing in the high-country overlooking Rangeley Lake. After a day of golf or fishing, it’s back to your lakeside cabin and a home-cooked dinner with all the fixins’. Then spend the evening wading and casting to rising trout on Thomas Pool or just relaxing on your screened-in porch. It’s the ideal package for the fisherman/golfer. For complete package information, give us a call at 1-800-633-4815 or e-mail us and mention Golf and Fish. Golf and Fish 5 day fishing and golf package includes: Lakeside cabin, 3 meals a day, boat, motor, guide for 3 days, and 2 days of golf at two different 18-hole golf courses in the mountains.$1,500 per sportsman, double occupancy, tax not included. A 5 day hunting and fishing package. Pack up your double-barrel and fly rod and join us in October for 5 days of hunting and fishing in the western mountains of Maine. 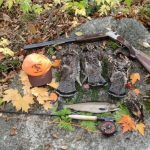 Hunt for ruffed grouse, woodcock and migratory birds. With over a thousand acres of mixed growth and spruce patches behind a controlled gate, it’s much like having your own private hunting preserve. 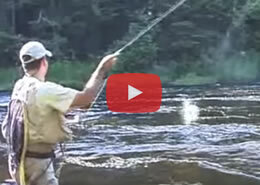 With your guide, you will fly fish for salmon and trout on our lake, and take side trips, to fish the Rangeley River and the famous Upper Dam Pool where Carrie Stevens originated and tied the Gray Ghost Streamer. Cast and Blast 5 day hunting and fishing package includes: Lakeside cabin, 3 home-cooked meals a day, boat, motor, guide and dog for 4 days. $1,400 per sportsman, double-occupancy, tax not included.